We’d like to hang out with our backers, friends, and supporters more often. So, we’re hosting happy hours to that end. The first one will be Thursday October 23rd. Come share your ideas for the film. Ask questions. Tell us about what you’re making. Enjoy a beer, cider or cocktail (or two). We had a good shoot last night on Broadway. I can’t believe more of you didn’t come. Doesn’t this look like fun? It was! A few random people walking by even jumped in and showed off their moves. I love this city. Thanks to Danny at Spin Cycle, the music/game store we filmed in front of, for helping out and and even playing music for us to dance to outside. Filming this Thursday : Extras needed! We’re filming this Thursday on Cap Hill and need some extras. This is your chance to be in the film. 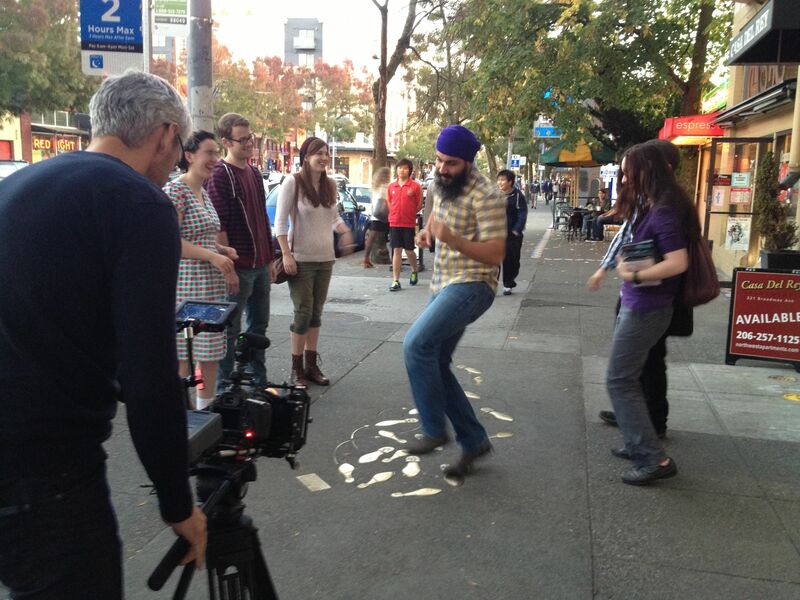 This shoot is to capture the sidewalk dance sculptures on Broadway. They’re legendary symbols of creativity in Seattle and we finally got official permission to film them. Bridge filming: Last week Dan and I got up at 6:30am to get some magic hour footage of the 520 bridge construction. The idea for this particular shot was to capture being on a bridge which watching a bridge grow, which is an unusual site to see in any city. And as bridges are mega-scale making efforts, it seemed a worthwhile shot to go after. The light didn’t co-operate – we only only had a few good moments of light. But I’ll pick up the footage from Dan tonight and see what we have. If it’s worthwhile we may give it another go. Last night we filmed at UXHH, a happy hour for designers, hosted at Substantial’s beautiful office on Capitol Hill. It was a fun, chaotic, shoot, but it was all part of the plan. The hope was that filming during a happy hour of designers would make it easy to find people willing to draw and design things at the whiteboard and I was right. Give in to a little chaos, you get a different kind of energy on film in return. The fancy Minority Report looking screen is a Bluescape, and we filmed Donte Parks, a friend and one of the founders of Substantial, demoing it on film. Things continue to roll along here at WMS HQ. Our next shoot is on Tuesday, filming at Substantial on Capitol Hill. They’ll be hosting a designer happy hour (UXHH), providing us with a beautiful office filled with creative folks. We’re also hoping to get some b-roll footage of bike polo, which is played right outside on Tuesday nights. As you might have noticed we’ve already completed shoots at Seattle’s Folklife Festival and Myrtle Edwards & Sculpture Park. We’re currently working on the logistics of shooting the Fremont bridge along with the Port of Seattle. Sorting out the feasibility of these shoots, permits, and time frames for getting the shots we want. Weeks ago we put out a call for locations and many of you filled our inbox with suggestions. Thanks! Many of you also said “Film us!” which was sweet and charming. Since you folks made the film possible we’ve come up with a way to make your request possible – at least for one of you. We’re inviting you to take your cellphone camera out and film where you work and the cool people in it. Tell us a brief story of where you work, and share on camera how fun and awesome you are. Answer the question: Why should your workplace represent creativity in Seattle to the world? Show us.